Frozen or Teenage Mutant Ninja Turtles Kid's Pocket Digital Video Recorder As Low As $19.89 + FREE Store Pickup! You are here: Home / Great Deals / Frozen or Teenage Mutant Ninja Turtles Kid’s Pocket Digital Video Recorder As Low As $19.89 + FREE Store Pickup! Frozen or Teenage Mutant Ninja Turtles Kid’s Pocket Digital Video Recorder As Low As $19.89 + FREE Store Pickup! If your kids are looking for a way to spend their Walmart gift card, here’s a fun idea! These Frozen or Teenage Mutant Ninja Turtles Kid’s Pocket Digital Video Recorders are on CLEARANCE for As Low As $19.89 + FREE Store Pickup if available in your area! 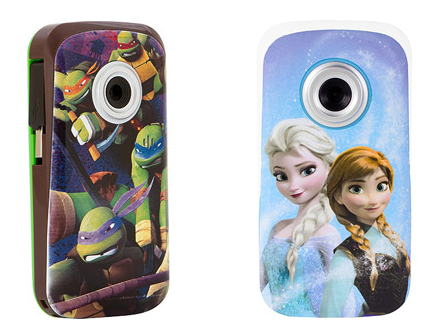 Your child with have a blast recording their video clips with the Disney’s Frozen Pocket Digital Video Recorder. Video editing software is included.